The Cleveland Indians head to PNC Park on Sunday to take on the Pittsburgh Pirates. The Indians send Danny Salazar to the mound to face Gerrit Cole of the Pirates. The opening line for this matchup has Cleveland at +128 and Pittsburgh at -138. The over/under was set at 6.5. The Indians, with a 34-45 run line record, cover the spread 43% of the time. They also have a 38-40 over/under record. The Pirates have a 33-38 over/under record and a 35-44 run line mark, which means they are covering the spread 44% of the time. The Indians show up with a 38-41 record, including 23-18 on the road. Danny Salazar has a 7-3 record on the season, an earned run average of 3.80 and a 1.16 WHIP. The Indians are 10-4 over his 85.1 innings pitched and he's also given up 75 hits over that time period. The Indians are also 8-6 against the over/under in his starts. The team is averaging 5.3 runs when he starts. The bullpen's earned run average is currently 3.15 and they've given up 204 hits on the season. Opposing teams are hitting .234 against the Indians bullpen while walking 87 times and striking out 242 times. Cleveland is averaging 9.48 strikeouts per game while getting 8.38 hits per nine innings as a team. They rank 17th in baseball in team earned run average at 3.93. Cleveland is batting .252 as a team, which is good for 17th in the league and hitting .246 away from home. Ranked at 6th in the league in on-base percentage, the Indians sit at .325 and they hold a .391 team slugging percentage. Jason Kipnis leads the team in hits with 108 while the team ranks 18th in baseball with 8.48 hits per game. Pittsburgh is 24-15 at home while holding a 45-34 overall record on the season. Gerrit Cole has a record of 11-3 while sporting an earned run average of 2.20 on the year with a 1.14 WHIP. The Pirates have a record of 12-4 over the 102.1 innings he's pitched during which he's given up 92 hits. The Pirates are also 5-9 against the over/under in his starts. The team is averaging 3.8 runs when he takes the field. The bullpen's earned run average is currently at 2.56 and they have given up 219 hits on the season. Opposing teams are hitting .236 against the Pirates bullpen while walking 70 times and striking out 215 times. Pittsburgh is averaging 7.94 strikeouts per game while getting 8.35 hits per nine innings as a team. They rank 2nd in the league in team earned run average at 2.94. They are batting .258 as a team, which is good for 10th in the league and hitting .259 at home. Ranked at 13th in the league in on-base percentage, the Pirates sit at .318 and they hold a .384 team slugging percentage. 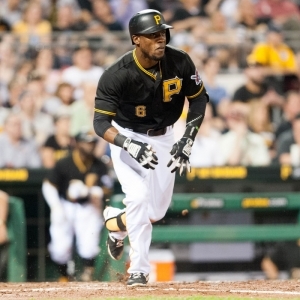 Starling Marte leads the team in hits with 85 while the team ranks 7th in baseball with 8.99 hits a game. The Indians have committed 45 errors and have combined for 726 assists and 2,098 put outs leading to a .984 team fielding percentage. The Pirates have committed 55 errors on the season with 940 assists and 2,186 put outs leading to a team fielding percentage of .983 on the year.